If you’re used to scalping EBL and SBL girls, you’ll be surprised to find there is now a third screw in the back of RBL’s head. First, remove all three screws (put them in a safe place). use a crochet hook or tweezers to un-hook the spring in the square hole. Next, squeeze her ears to release the clips underneath them. The back of her head should lift off easily. You will see one more screw located in her forehead. loosen it halfway. Her scalp will now lift off of her head. If you’re opening her to do makeup or eyechip work, you’re done! 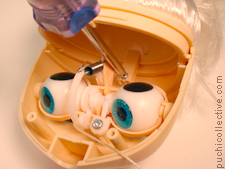 You can follow the same eye removal procedure, starting with step 2. The new Radiant scalp is a 2-piece contraption – a soft rubber scalp with a long flange pinched into a hard plastic dome piece. Since the only RBL I have to work with at the moment is Darling Diva, and I don’t plan on removing her scalp completely, I will just let you know what my findings are with the new scalp.It appears that there is no glue used to hold the scalp to the cap, just a friction fit (a very tight one at that). above you can see I used an exacto blade to make sure the flange would separate cleanly from the cap. I then used a screwdriver to see if the flange would be able to be pried out of the cap. It slipped out fairly easily. Putting it back, seems to be another story. the softness of the rubber makes it difficult to re-insert. I stopped after prying a few centimeters so that I wouldn’t have an impossible-to-assemble scalp on my hands.From what I can tell, after the scalp is removed, the flange will probably have to be cut shorter and then reinserted. I’ll update this tutorial after the first regular-priced release is made available and I can really experiment on the scalp. Until then, remove your RBL’s scalps at your own risk! What do you suppose is that hole up there in the dome for? I don’t know if it serves a functional purpose. Perhaps a hole was necessary or added convenience to the molding process, or scalp-attachment process. I wouldn’t say it is necessary for removing the scalp. this is so exciting! 😀 thanks for sharing with us Melissa! >>What do you suppose is that hole up there in the dome for? Thank you so much! I doubt I’ll be doing any customs on the new girls anytime soon but I was curious about the mechanics of the RBL!!! I’m really pleased to see it’s easy to open their heads like this.. less sweat from freaking out and tears from possibly breaking something!!! I guess it won’t be possible to replace the rubber scalp of RBL by that of EBL or SBL? I guess if the flange shape of RBL is similar to SBL and the two scalps can be swapped. Also with some cutting-sanding of the rubber flange! I think may be the hole in back would be designed for customisers to do the “sleepy eyes”? 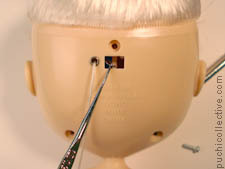 Jenn – the RBL head would definitely be the easiest – you just remove the screws and squeeze her ears! the square hole in back is for the spring attachment, just like all the previous models. the other holes are screw-holes and of course, the string-hole. I suppose that hole up there is for mohair rerooting… ??? that’s a good point bigeye… that spot is very convenient for weft mohair. Any updates? I’m ready to mohair reroot my Aubrey. Should I be worried? Tina, before you remove the hair from your Aubrey, there’s a few people with Aubries that has problem hair… I would suggest you to open the chance for scalp trade. 🙂 For example at This Is Blythe forum aswell as Blythedoll LJ community. argh! I am going to reroot my aubrey too! nightmare! I’m dying to see a tutorial on RBL scalping and reattaching! Felicia – did you pull the soft flange completely out of the hard cap? if you did, you’ll have to experiment a bit or maybe someone else can comment on how to get it back in – I have never taken the scalp all the way out of a RBL before. if you just took the three pieces of the head apart, all you do is reverse the steps above – screw the scalp to the front faceplate, snap on the back faceplate and put in the 3 screws. i want to open my ebonys head to make it easier for sandmatting,do i just basically undo all the 3 screws at the back of her head and squish her ears in then? do you know what model neo blythe feel the sky is as i see she only has 3 screws how do i open her up? ive tried opening my ebonys head up but cant get it open do you know what im doing wrong perhpas? I’m having the same problems as Sophie with my Ebony! Her head just won’t come apart. you have to squeeze the ears VERY hard. Sophie – you might want to try a tiny Crochet hook, say size 11 (see pic 1)? pick up the spring from the hole in the back of the head with the hook, then VERY carefully make the gap at the end of the spring wider with the tweezer. Good luck! yeah, in the latest dolls, it seems they “pinched” the last loop of the spring around the post. it’s a little harder to take it off than the earlier girls, but it does come off. crochet hook gets it every time. I am new at Blythe doll customization and was wondering if you have removed to scalp on a RBL yet? 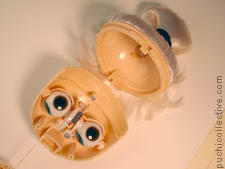 I receive my saffy soon and was hoping to go off your tutorial on how to remove scalp and glue it back on – Do you think I should buy E-6000 Craft Adhesive and Aleene’s Tacky Glue to glue it back together? I am stocking up on amazon and want to make sure I buy everything I need in the one order. natalie – you are removing a scalp for rerooting? if you are not making changes to the hair, you do not need to remove the scalp. the scalp comes off by unscrewing two screws. 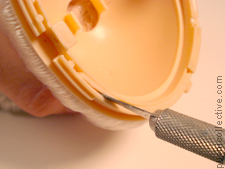 if you no need to remove the scalp from the dome, you will probably need to remove most of the flange. you could use e6000 glue. tacky glue would work too, and be easier to remove in the future. just put glue around the edge, not the area that has hair. 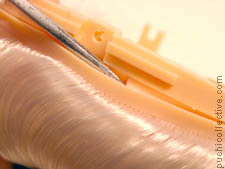 RBLs have no glue attaching their scalps, it’s a compression fit. Yes I will be re-rooting the hair with 2 weft’s still trying to figure out how to do this? Sorry for this silly question but what’s the Flange? Also, Do you think I should buy a New Scalp piece to sew the weft’s into or can I use the original scalp on the Blythe. natalie – see the picture in step 6? 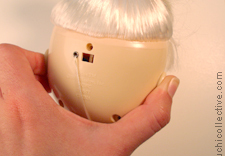 It’s showing the soft scalp as it is attached to a hard plastic ring that fits into the front and back faceplates. the “flange” is the thin part that goes down into the hard plastic ring. friction keeps it in place, not glue. When you unscrew her head parts, you will have to pull the scalp from the hard ring and the Flange is so long and thin that it will be very difficult to get back in, which is why I think you will have to trim it down to maybe 1/8 of an inch, and then glue it back in the slot with white glue. hello there..i want to know..i have a save the animals blythe doll.. i she RBL?? Hi, there… I am in the midst of my first customization effort, on a RBL. The flange gave me a little bit of trouble – there was one spot in the front of the head that appeared to be glued, and really didn’t want to budge even after a good, hot soaking. I ended up cutting through it and digging out the leftover piece bit by bit. Also, part of the plastic that the flange fits into (on the outside of the ‘skull’, I suppose) is fairly thin and delicate – be careful to try and use a more solid portion of the skull to use as leverage when pulling off the scalp! Okay, here is my update… it was not necessary to trim the flange at all when reassembling the head! it took some doing, but I worked the scalp flange back into the skull with a bit of effort. There was a small gap in the scalp seam on one side of her head, but it’s on a mohair reroot so it REALLY doesn’t show. Others might want to glue it a bit, but I didn’t need to. Good luck with your RBL’s! Thanks again for this great tutorial! I was having problems unhooking the spring with my crochet hook (I’ve only rehooked one that came to me unhooked) so I did the entire head opening and then unhooked it from the inside. It was much easier without all of that tension pulling it. is primadolly aubrey Radiance or Superior? So, i think I have the hole in the head mystery figured out. I noticed that there was lot of poofiness of the scalp, a small pocket of air between the scalp itself and the hard plastic skull-dome. Presumably to give the hair some additional height in the cheapest way possible. I bet the hole is there so that the scalp doesn’t get sucked down to the head when you press on it. It certainly is nice to know that when you wash your Blythe’s hair that there’s an exit for the water on the other side of the scalp. I always worried about head mold when i washed my SBL. I’ve managed everything except when it came time to put things together again I couldn’t get the spring reattached easily. When I did reattach it I stretched it. Yuk! Now it doesn’t hold. I am going to do sleep eyes but if I wanted to use the spring again, it doesn’t hold. Can they be replaced or fixed? I am having terrible trouble getting my Night Flower’s head apart. I removed the scalp, unhooked the spring and unscrewed the screws…. I can get the front and back pieces to separate from each other enough to get her body out but it will not separate closer to the scull….. I feel like I am butchering her! What is going on? I opened a Angelica Eve yesterday and had no problem whatsoever…. Did you try opening Miss Sally Rice? Mine was more difficult than other Rbl. I opened Ebony without problems but MSR’s faceplates didn’t come apart! I had to help the scalp line to come off with an x-acto knife.. I wonder if it’s mine only difficult to open! babet – my MSR was REALLY hard to pop, but she did open. I just had to set her on one ear (on a towel) on a hard surface and press the other ear with both hands and a good amount of my body weight. it was scary! I see there were some others who had trouble unhooking the spring in the back of Ebony’s head. If I understand it you use the hook to lift the spring and the tweezers to open the gap that’s wrapped around the bar? For rehooking the spring once the head is closed up how is that done? Is the spring flopping around inside and difficult to get hold of? I’ve been stumped at the unhooking the spring part for a few days now….